The Family of Rotary is busy to prepare for the official visit of District Governor Haresh L. Ramchandani, PHF, and his wife First Lady Vandana, who will arrive on Monday 7thNovember. Their home is in Montego Bay, Jamaica, where he is a Real Estate Developer by profession. They have two children, Shiv, 14 & Shya, 12 years old. The District Governor, who was sworn into office effective 1 July 2016 for the term of one year, is overseeing the Caribbean District 7020. District 7020 comprises the following countries: Anguilla, Bahamas (except Grand Bahama), British Virgin Islands, The Cayman Islands, French West Indies (St-Martin & St-Barthelemy only), Haiti, Jamaica, Netherland Antilles (Sint-Maarten only), Turks & Caicos & The U.S. Virgin Islands. 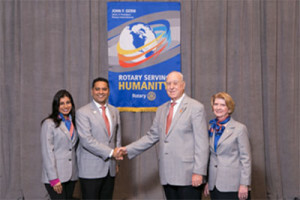 There are 84 Rotary Clubs in the 10 Countries plus one “e-Club”. His week-long visit has a packed agenda, starting with a reception hosted by Premier Dr. The Hon. D. Orlando Smith, OBE & First Lady Lorna Smith, OBE. He will appear on JTV, hosted by Enju En Ka on Tuesday. The DG will pay courtesy calls on His Excellency Governor John Duncan, OBE and Premier Dr. The Hon. D. Orlando Smith, OBE. Both Gentleman are also members of the Rotary Club of Tortola. DG Haresh will visit with the three Rotary Clubs: RC of Tortola, RC of Road Town and RC Sunrise of Road Town, as well as the Rotaract Club of Tortola, Interact Club of Road Town & Cedar School Int’l, along with five EarlyAct Clubs in Schools throughout the Territory, before heading to Virgin Gorda, where he will be hosted by the Rotaract Club of Virgin Gorda and Interact Club of Bregada Flax Educational Center, followed by a tour of the sister Island. Back on Tortola, he will be taken on a tour of the Island and visit projects completed by Rotarians, Rotaractors and Interactors, during which time he will be interviewed by Radio Station ZBVI. Instead of staying at a Hotel, Rotarian Rosemarie Flax and her husband Keith extend home hospitality – BVI Style – to the guests. The visit will culminate with the DG Haresh and his wife Vandana being the Guests of Honour at the third annual Foundation Dinner, held at The Moorings Restaurant on Saturday, 12thNovember. Rotary International was founded 23rd February 1905 by Paul Harris and four of his business associates, while the Rotary Foundation was established in 1917 by then outgoing Rotary International President Arch Klumph and has its Centennial Celebration in 2017. President Arch Klumph proposed to set up an endowment “for the purpose of doing good in the world.” In 1928, it was renamed “The Rotary Foundation”, and it became a distinct entity within Rotary International. Arch Klumph declared “We should not live for ourselves alone, but for the joy in doing good for others”. The Rotary Foundation is a not-for-profit corporation that supports the efforts of Rotary International to achieve world understanding and peace through international humanitarian, educational and cultural exchange programs. New district, global, and packaged grants enable Rotarians around the world to respond to the world’s greatest needs. Since the first donation of $26.50 in 1917, the Foundation has received contributions totaling more than $1 billion.